I'm finally getting back to playing along with Mojo Monday Sketches! I did really well with keeping up the month of January and then got behind in February. Since my goal is to complete them all, I have printed out the ones I missed and have set them aside to use in future card designs. This is the current week's Mojo Monday Sketch and my somewhat 'loose' interpretation of it. I used Verve's Believe stamp set, Sprightly Sprigs die, and Award Banner Trim die. I created this card for a friend of mine who is battling cancer. I created the card in this blue shade as that is the color of the awareness ribbon for the type of cancer she has. I'd also like to share it at the Word Art Wednesday Challenge. Thanks for stopping by. I hope you have had a blessed weekend. Thanks for reminding me that I too have this wonderful stamp set, and it's just what I need for a friend who is also battling cancer! I LOVE the gorgeous blue color and amazing flower! This is definitely a WOW factor card for me! Beautiful! Beautiful card, the blue and kraft are so lovely together. Take my breath away beauty on this amazing design, Jeffipher! 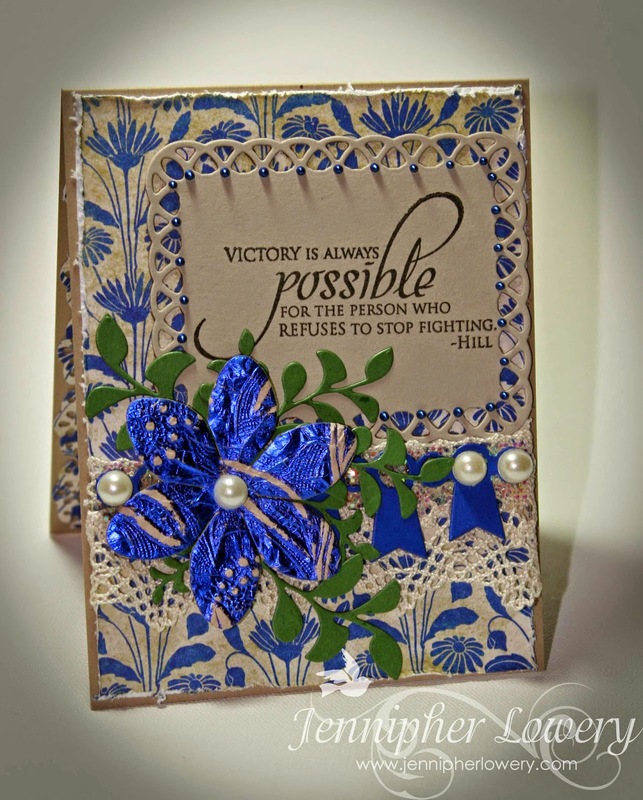 The pearls, the lace, and the bold blue blossom backed by your gorgeous die cut leaves make for a remarkable card. What a blessing it will be for your dear friend. Your card is stunning! I'm sure your friend will be blessed by this "Hug with a Fold in the Middle." Gorgeous card design! The sentiment is awesome. Love this encouraging card for your friend, and most of all, the love that your poured into making it- which is so obvious! This card is very elegant, the lace and pearls are so pretty. Thank you so much for entering our A.G. family friendly challenge this week at Word Art Wednesday. Remember, you can enter up to five times. We enjoy seeing your lovely creations. This is so amazing...Love the lay-out, the DP, sentiment and that awesome flower. We are so blessed that you joined our Challenge at Word Art Wednesday last week. We started a new Challenge today and will be delighted for you to come back and link up once more. Leaving you with this encouraging Word of God in Romans 15:4 and it says, "For whatever was written in former days was written for our instruction, that through endurance and through the encouragement of the Scriptures we might have hope." Have a great week. Wow, wow, WOW! This is GORGEOUS! I love all of the details...the bold colors against the neutral tones.